Flying Fisherman Sailfish fitted trucker cap, in black with black mesh back or graphite with graphite mesh back. Flat brim with black tone on tone stitching, or Graphite tone on tone stitching. Dark Non-glare under visor. 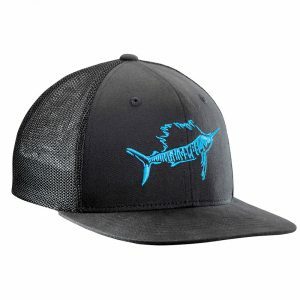 Sailfish direct embroidery on crown with Flying Fisherman logo embroidered on mesh back. 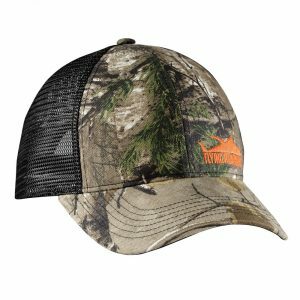 Flying Fisherman Tuna RealTree© Camo Trucker Cap in camo with black mesh back. Adjustable snap back closure. Curved bill with black stitching. Dark Non-glare undervisor. One size fits most. 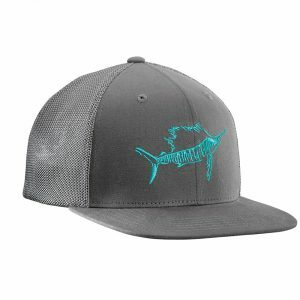 Tuna direct embroidery on side crown with Flying Fisherman logo embroidered on mesh back. 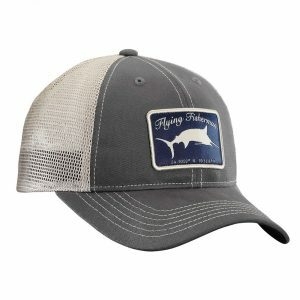 Flying Fisherman Marlin trucker cap in graphite with stone mesh back or navy with white mesh back. Adjustable hook & loop strap closure. Curved bill with stone contrast stitching. Dark Non-glare under visor. One size fits most. Marlin Woven Label Patch featured on Dark Graphite crown with Stone colored mesh back. Flying Fisherman logo tag on back. 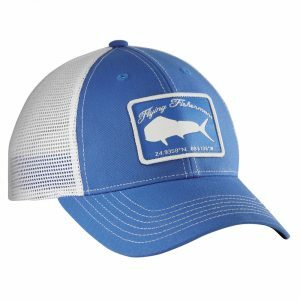 Flying Fisherman Mahi Trucker Cap in royal blue with white mesh back. Adjustable snap back closure. 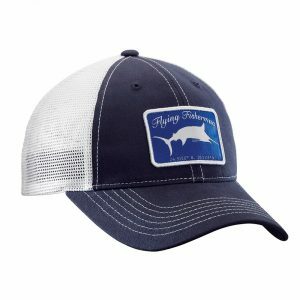 Curved bill with white stitching. Dark Non-glare undervisor. One size fits most. Mahi woven label patch with Flying Fisherman logo tag on mesh back. 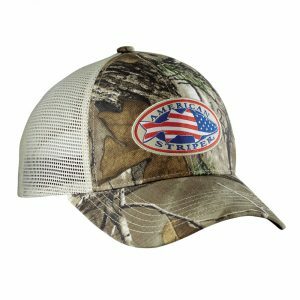 Flying Fisherman American Striper RealTree© Camo Trucker Cap in camo with khaki mesh back. Adjustable snap back closure. Curved bill with khaki stitching. Dark Non-glare undervisor. One size fits most. Striper woven label patch featured on camo crown with Flying Fisherman logo embroidered on back.